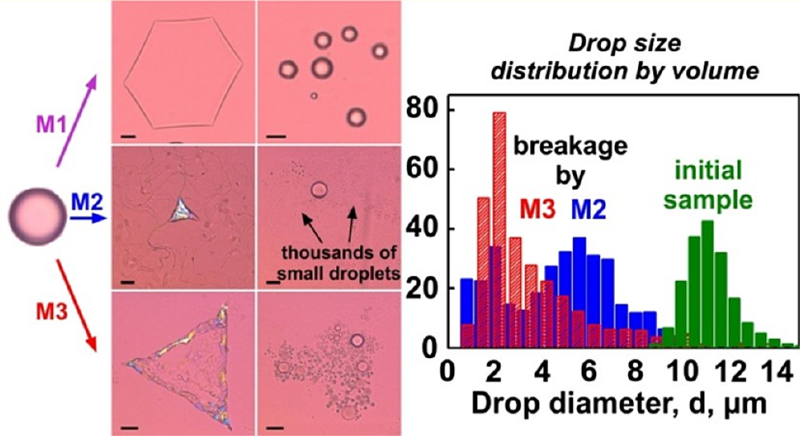 Emulsification requires drop breakage and creation of a large interfacial area between immiscible liquid phases. Usually, high-shear or high-pressure emulsification devices that generate heat and increase the emulsion temperature are used to obtain emulsions with micrometer and submicrometer droplets. Recently, we reported a new, efficient procedure of self-emulsification (Tcholakova et al. Nat. Commun. 2017, 8, 15012), which consists of one to several cycles of freezing and melting of predispersed alkane drops in a coarse oil-in-water emulsion. Within these freeze−thaw cycles of the dispersed drops, the latter burst spontaneously into hundreds and thousands of smaller droplets without using any mechanical agitation. Here, we clarify the main factors and mechanisms, which drive this self-emulsification process, by exploring systematically the effects of the oil and surfactant types, the cooling rate, and the initial drop size. We show that the typical size of the droplets, generated by this method, is controlled by the size of the structural domains formed in the cooling−freezing stage of the procedure. Depending on the leading mechanism, these could be the diameter of the fibers formed upon drop self-shaping or the size of the crystal domains formed at the moment of drop-freezing. Generally, surfactant tails that are 0−2 carbon atoms longer than the oil molecules are most appropriate to observe efficient self-emulsification. The specific requirements for the realization of different mechanisms are clarified and discussed. The relative efficiencies of the three different mechanisms, as a function of the droplet size and cooling procedure, are compared in controlled experiments to provide guidance for understanding and further optimization and scale-up of this self-emulsification process.